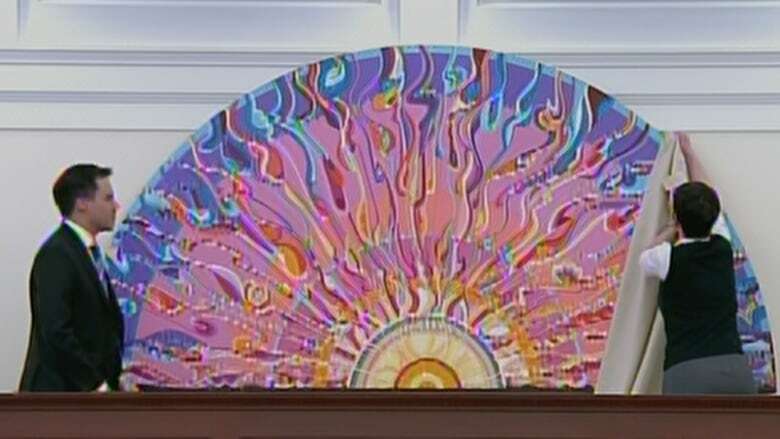 A new work by renowned Alberta artist Alex Janvier was unveiled in the Alberta legislative assembly chamber Monday. A new work of art by Alberta artist Alex Janvier now looks down upon members of the Alberta legislative assembly in the chamber. Sunrise and Sunset, a diptych, was unveiled Monday with an "honour song" featuring traditional Indigenous drummers, a prayer and smudging. Janvier said it was an honour to show his work in the "house of talk," which is how the legislature is described in his language. "I want to congratulate Alberta for [inviting] for the first time our people to come into a place of speaking and to be allowed to be heard," he said. Janvier, 84, is known around the world for his celebrated abstract works and is a member of the "Indian Group of Seven," Indigenous artists who have influenced generations of emerging talents. "They say sunny Alberta and so I used that as the key element in my painting," Janvier said. Janvier, of Denesuline and Saulteaux descent, is from the Le Goff Reserve near Cold Lake. 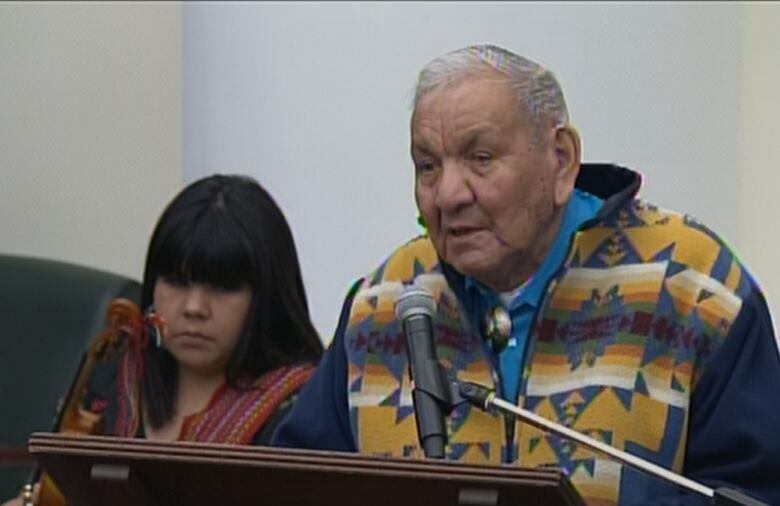 He is a residential school survivor, having attended Blue Quills Indian Residential School near St. Paul. In 2007, Janvier was made a member of the Order of Canada. The Alberta Union of Provincial Employees commissioned the work as a gift to Alberta. "Thank you for your work, your passion and your spirit that went into creating this permanent, public reminder of the past and present prominence, contributions, and struggles of Indigenous peoples in Alberta," said Guy Smith, AUPE president, thanking Janvier. "It is a powerful homage to the Indigenous people who have lived, created, and laboured on the lands that are now called Alberta," Smith said.